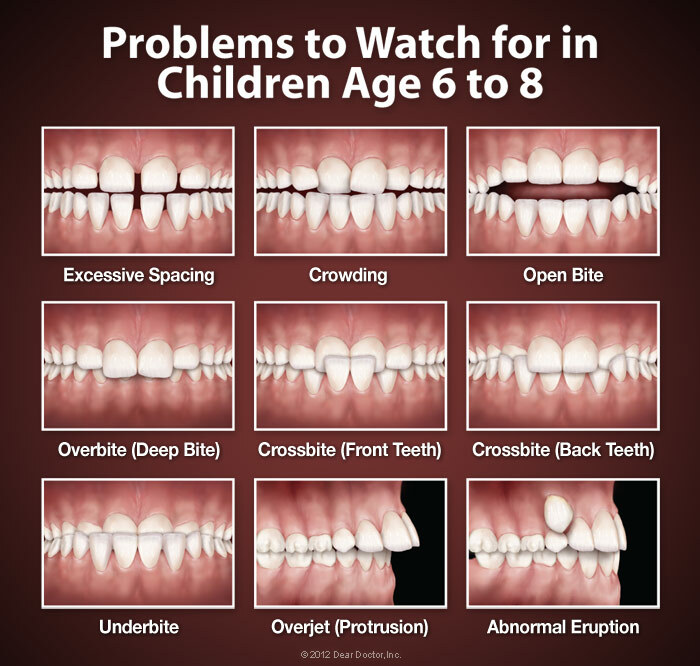 We recommend having an orthodontic evaluation between the ages of 3-12 years old. We excel at early interceptive orthodontics with treatments that not only straighten crooked teeth, but also address and improve skeletal and dental problems by correcting the underlying causes: improper breathing and swallowing. Addressing these causes earlier in life, when children are actively growing, will help kids return to more normal growth and development. One condition that may benefit from early treatment is severe crowding. This occurs when the jaws are too small to accommodate all of the permanent teeth. Palatal expansion may be recommended at this point, to help the adult teeth erupt (emerge from below the gums) properly. Even if braces are required later, the treatment time will likely be shorter and less complicated. Think of it as Black Friday in your mouth. Your teeth finally break through the gum line, only to be trampled by some jerk of a molar. When there’s no room for all your teeth to grow correctly, twisting or displacing can happen. Crowding can be caused by both abnormal growth and primary teeth being lost too early or late. By expanding the arches of your orthodontic device or removing teeth altogether, we can then use braces to stop crowding. In addition to giving them the room to be the teeth they were always meant to be, this process has the benefit of preventing decay and disease because it will be easier to remove plaque from your teeth. Early intervention may also be helpful in resolving several other problems. Protruding teeth, especially in front, can be prone to chipping and fractures; they may also lead to problems with a child's self-image. A severe underbite, caused by the lower jaw growing much larger than the upper jaw, can result in serious bite problems. This is the opposite of crowding, where your teeth feel like they’re living way out in the country of your mouth, with the nearest tooth a ways down the gum line. This can happen when teeth are smaller than the space meant for them. It’s a condition, also called gap teeth, that can be caused by protruding, missing, or impacted teeth too. The problem can be simply solved by bringing teeth closer together, while also aligning them through treatment. Addressing the issue can better protect your gums and help your teeth to work the way they should. Plus, your smile will thank you. This is something that is seen in the front and sides of the mouth. When upper teeth decide to zig when they should have zagged, crossbite can appear. The situation can result in tooth wear, gum disease, poor jaw growth and struggle chewing. The good news is this condition can be corrected through braces and retainers. We now call this meeting of Thumb Suckers Anonymous to order. The piece of business we need to discuss is openbite, which can be a result of bad oral habits and uneven jaw growth. 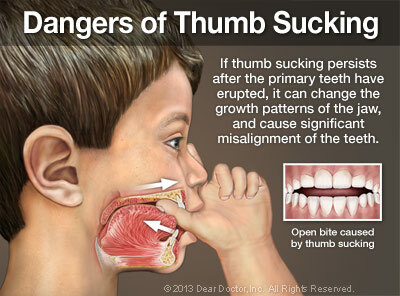 This is also something that can be addressed with braces, surgery or just putting away your thumb. The sucking reflex is natural in early childhood; it usually disappears between ages 2 and 4. But if it persists much later, the pressure of the digit on the front teeth and the upper jaw can actually cause the teeth to move apart and the jaws to change shape. This can lead to the orthodontic problem called “open bite,” and may impair speech. An open bite can also be caused by the force of the tongue pushing forward against the teeth (tongue thrusting). Overbite is when the upper front teeth protrude over the lower front teeth. While your lower teeth might enjoy the shade, this unfortunately also leaves tissue and wearing problems and can even effect how well your teeth work. Just like the other conditions that we’re talking about, this issue can also be corrected through orthodontic procedures. As cool as a word like overjet sounds, it’s not a fun thing to have. It actually means your lower teeth are too far behind your upper teeth. This can be cause by misalignments, imbalances and other factors. Plus, overjet has the ability to negatively impact those with already bad oral habits like thumb sucking. However, with orthodontic appliances and elastics, it can be treated. You’re smart enough to have guessed that underbite is the opposite of overbite. This condition comes with many of the same causes as overbite too. The causes just have negative effects in the other direction. While they may be opposites, the same orthodontic solutions to overbites can be applied to underbites. When a budding tooth is out of place, it can become impacted. This means that it may not break through the gum tissue as it grows. Think of it as the little engine that couldn’t. It’s an issue that can also come from losing baby teeth too early or tooth crowding. Becoming impacted is most common in wisdom teeth, but it can happen in others as well. We usually correct this problem by gradually exposing the impacted tooth during a series of visits where we can guide it into the right position. It’s just like herding teeth. Depending on the situation, it can also be cause for a minor procedure from an oral surgeon. No matter the solution, we make sure that impacted teeth cause as little damage and unwanted effects as possible. Missing teeth can be a result of trauma or poor development. When teeth that should otherwise be there have gone AWOL, we have a number of procedures that can get things in your mouth back to normal. Braces can close the space left by the dearly departed tooth. On the other side of that coin, bridges or dental implants can replace the culprit. Any of these answers to your problems can improve both how your teeth work and how they appear. Mouth breathing — an abnormal breathing pattern in which the mouth always remains open, passing air directly to the lungs — is related to alterations in the muscular function of the tongue and face. Mouth breathing can cause a narrow upper jaw, cross bites, poor growth patterns, more trips to the doctor for sickness, TMJ problems, and in extreme cases, even sleep apnea and sleep disordered breathing (SDB). 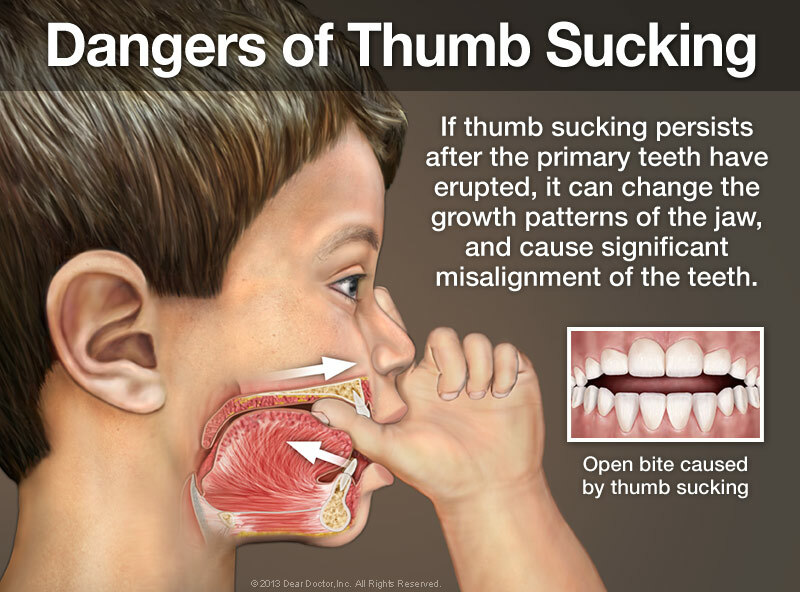 Improper swallowing can result in tongue thrusting, speech problems and other muscular imbalances that may produce enough pressure to move teeth out of normal positions and change the structure of the face.